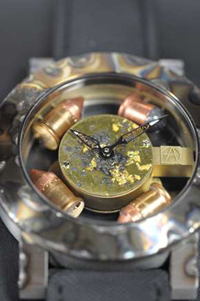 Later, together with Jean-Claude Biver has worked for Hublot, and the real fame came to him in 2007, when Arp, who took a little-known brand Romain Jerome, came up with a sensational concept Titanic DNA – the watch with inserts of this rusty shell of “Titanic.” In 2009, Arp and his wife set up his own watch company – ArtyA. The main know-how to master – processing technology housing high voltage Coup de Foudre, with the result that the surface acquires a unique pattern. That’s why every model from Artya unique. Another finding is the choice of materials dials. Here Arp shows boundless imagination, using butterfly wings, feces mammoth Australian sand and even casings from bullets.